Great picture. I love the contrast, hard heavy weights all around and a little sweet girl in pink, the DIVA, fab. Fab poem and cute pic! Fab poem and a beautiful little girl! 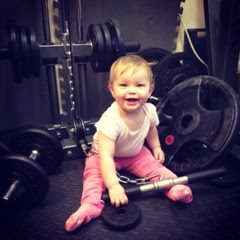 She looks dead sweet sat amongst all those weights! Just popped round to help boost those stats and am glad I did. That's masterful! My husband and I tend to have complementary tastes and ambitions when it comes to our kids, but even so my 10yo has still decided to be a rock-chick diva!